Happy October everyone! We spent the weekend looking for treasures at a local barn sale, managed to get the supplies for the boys' Halloween costumes, and started my Halloween decorating! When the calendar changes to October, it's time to start digging the Halloween decor out of the basement, and that is exactly what I did! 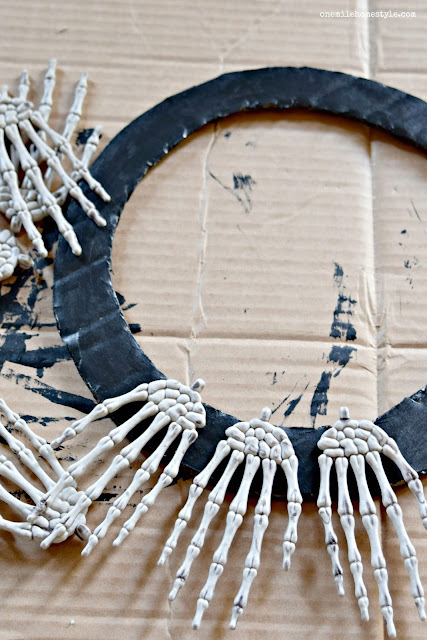 My new favorite Halloween decor is this super easy, creepy skeleton hands Halloween Wreath I made one afternoon. 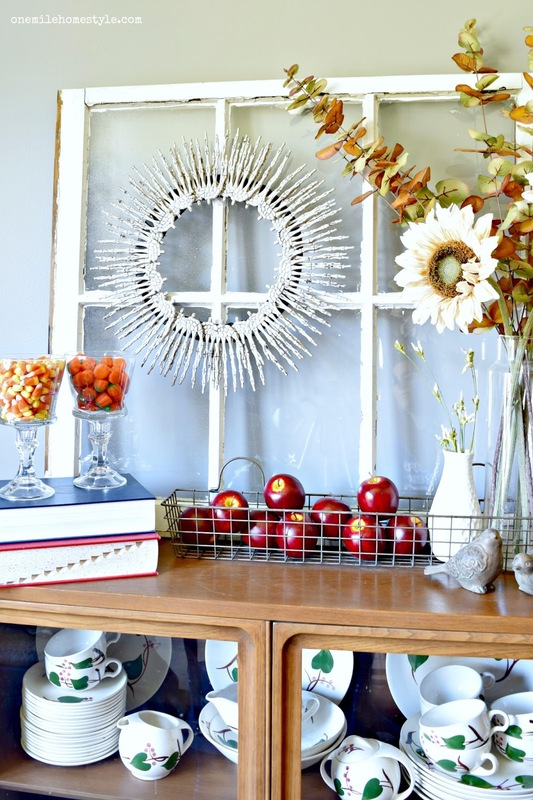 This was an easy project, and it adds such a fun little touch of Halloween to the fall decor that is already up. The first thing you will need to do is cut your cardboard into a ring to form the base of your wreath, the size will depend on how big you want your wreath to be. You will want your ring to be between 1-2 inches wide so you can easily attach the hands. 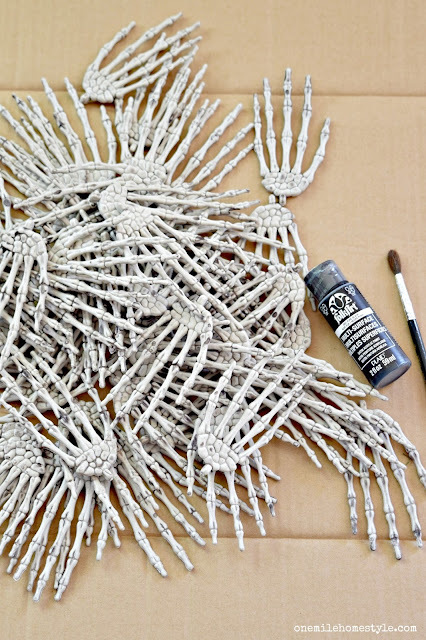 Once your ring is cut out, give it a couple of coats of black paint and let dry. Before you start gluing, I highly suggest laying all the hands around the wreath for a trial run before you start attaching them. This will help you get the spacing right and avoid any weird gaps. Once you have a spacing right, attach the hands one at a time in a single layer around the ring with the adhesive. and let dry. As soon as this first layer of hands is dry, go back and add another layer, staggering them across the first layer. 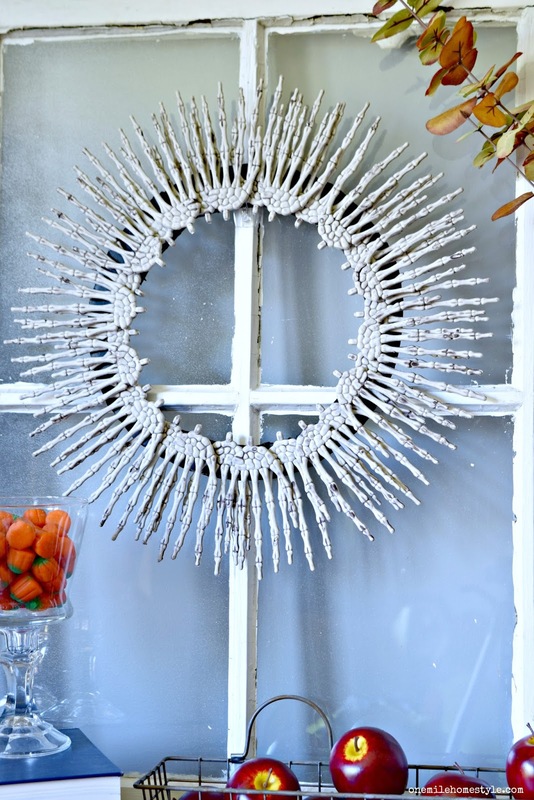 And once it's all completely dry, your fantastic new wreath is ready to hang! 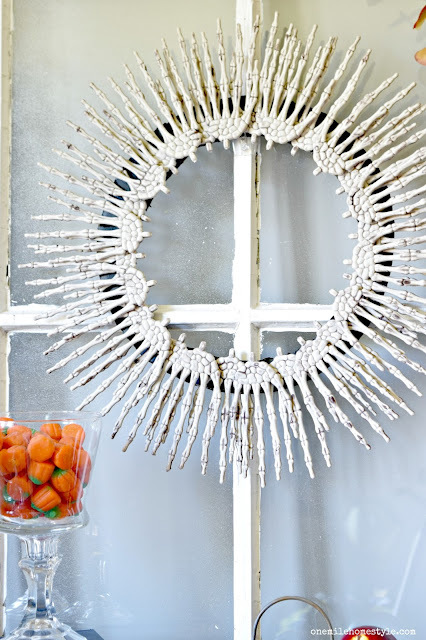 Since the base of this wreath is cardboard, it is staying indoors and out of the elements. 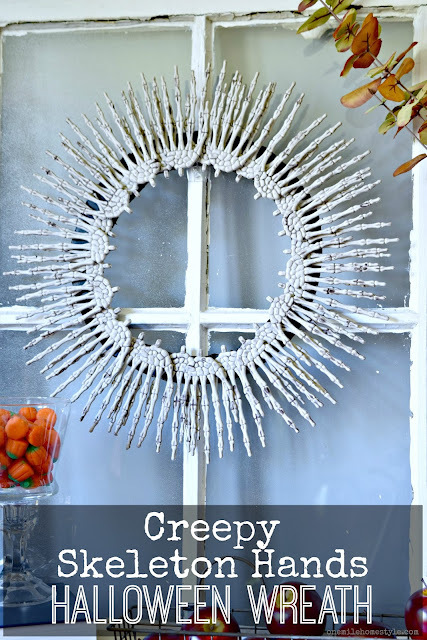 To hang it, I simply used a clear command hook to hang it on this old window and add that perfect creepy Halloween look to the fall decor. Isn't this such a fun little Halloween Wreath? Be sure to save it to you Halloween Pinterest Board!